[UPDATE] To order shoes from NikeID and ship to one of our border locations, you must complete a manual order with NikeID. You cannot buy the item on the website, you will need to call NikeID at 1-866-633-6453 and give them your Canadian billing information and your new US Shipping address. Have you ever bought some awesome shoes only to realize other people wearing the exact same pair? 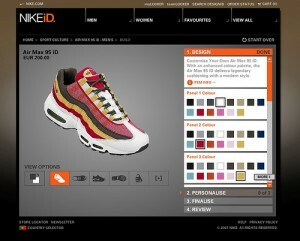 Well, the other day my friend told me about a great website made by Nike called NIKEiD. They give you the chance to customize your own shoes right on their website. You can choose everything from the materials used to the colors and even add a personalized tag. Not only did I think that was really cool, but your customized one of a kind shoes are about the same price as Nike shoes you will find in store. My friend was planning on buying a pair he had designed but there was a slight problem, Nike only ships their NIKEiD shoes to a US shipping address. That means those of us in Canada need to find another way to get our hands on them…and feet in them 😀 Thankfully I found a way for Canadians to get their customized shoes, using Kinek‘s alternative delivery network. They specialize in providing a place for you, a Canadian who wants to buy those customized shoes, to ship your order to, effectively giving you a shipping address in the United States. You can click here to find the most convenient location for you. All of the border locations are within a 10 minute drive from the border. So if you’re part of the 75% of Canadians that live within 100 miles of the border it would likely only take a few hours on a Saturday afternoon to get your new shoes! Now that I know about NIKEiD and the convenience of Kinek I plan on my next pair of shoes being designed by me using NIKEiD! Nike won’t ship to any p.o.boxes !!! It’s on their website!! DO YOU HAVE A LOCATION A ACCESSIBLE TO ALBERTA? Hi there, Kinek doesn’t forward items onto Canada. You would need to pick them up at a border location. Hi..I am from toronto, ontario..how can i get the customize shoes that i like from the website? It explains how to do this in the post you commented on. You simply call Nike at the # provided. I have ordered many things thru just this process you explain.. But Nike ID does not seem to accept payment any other way except with an American issued credit card. How do I get around this? You can use a Canadian credit card if you order over the phone. The phone number to call is listed in the above post. I hope this helps! Unfortunately, we do not forward items to Canada. You or a family member would need to come and pick up your shoes at the border KinekPoint. Hey, If I am in BC, whats an easy way to get NikeID shoes? The only and easiest way is described above in the blog post. First thing to do is sign up for Kinek and get your US shipping address in Blaine, Washington. Then, you will need to call the Nike 1-800# in the above post and give them your order and credit card, and new US shipping address info over the phone. I hope this helps! Hi, just thought I’d chime in. Nike has told me specifically that they won’t ship to a Kinek US shipping address either. I have an account and address in Blaine, and they cancelled my order after I called the number and placed it over the phone. The reason they specified was that they don’t ship to PO boxes, shipping services etc. That’s unfortunate as we’ve had users with success in the past. We do not forward items so it looks like Nike is labelling our locations as freight forwarders even though we do not provide that type of service. We apologize for any confusion. @jeremy – do you have kinekpoint around manitoba border??? We wil be setting one up very shortly. They are waiting to do some finishing touches on the office and need to get a telephone line. It should be no longer than 2-3 weeks from now. Most of our locations do not ship out, sorry. Only the postal stores such as UPS Stores can ship out, and that is separate from our Kinek service that receives packages. You could always go down to your nearest border crossing and visit the local USPS facility and ship out from there, and then use your Kinek US border location address as the return address. hows the new office near in manitoba border? Hi there! Are you hoping to be setting up one for Vancouver island anywhere? Or is that not possible to do. The U.S. border network needs to be on the U.S. side, so Vancouver Island wouldn’t work for U.S. shipments. So i have To call Nike id and tell To the person how built And customise my shoes, after pay with an Canadian credit card, give the postal code And all of a kinek point And i Will be txt or phone back when my shoes Will arrive at the kinek point ? Essentially, yes. You just call NikeID and give them your KinekPoint shipping address with your Canadian credit card info and make your order over the phone. Hi, I’m from Vancouver BC and wondering if you guys have a Seattle border location where I could pick up ordered NikeIDs from? Also what the cost of your service would be and if your trustworthy to hold a package that I paid for. Also earlier someone said that nike would not send packages to you because you’re freight forwarders? So will your service work or not? Kinek is by far the most trusted network of locations to ship your packages to. You have an account to manage your packages, apps to track them, and email and text notifications to let you know its there. It’s a nice set up! There is a location in Blaine, WA that everyone in the greater Vancouver area ships to. You just need to sign up for a free account to ship there. http://www.kinek.com/sign-up. I recently tried ordering from nike.com but they didn’t allow me to kinek id number in the address bar, so is there another way to do this. Yes, it explains right in this post how to get around this. You need to make a phone order. Is it necessary to provide the Kinek # in the address? Do I contact Kinek or the point/locaiton to see if my package has arrived? Who’s tried this method and how long has the shipments taken (I’m from Toronto)? Yes, it’s required to provide the Kinek# in the address. It’s used to send you an automated email when the package arrives. I don’t have a photo of that location but you can search in hundreds of forums and blogs online that reference the terrific service at the border KinekPoints. The location you’re referring to is A+. Im not fully sure what this does. So I live in Canada and I want to buy shoes from Nike but they only ship to the US. If I used the Kinek, does my package get shipped to kinek first, and then me? Or does the package get shipped to Kinek and I have to pick it up at a Kinek place? It get’s shipped to a Kinek US border location and you then drive down and pick it up. You save on international shipping, brokerage, etc. Hey, do you guys have a location in buffalo? I live in toronto, that’s the closest to me. And do i tell them that theyre gonna ship it to you guys? Yes, there’s a location in Buffalo, Niagara Falls, Lewiston, etc. You just sign up and provide the address to the retailer that Kinek provides you. If your dad creates a Kinek account in his name and ships the package, he can provide you with a copy of his photo ID and a copy of the receipt for the shoes. If you create a Kinek account and ship the package in your name, all you need to provide at the KinekPoint is a copy of your photo ID and a copy of the receipt for the shoes. I want to order from Nike and see from previous posts its not possible because they have you labelled as freight forwarder. Is this a problem for all your border locations. I was going to sign up to use your kingston or ogdensburg location. It outlines what you need to do in the original post. You need to call NikeID to make an order and they will be able to ship to Kinek. Can I pick up at sarnia/ port Huron border?